The Tyson Foundation, founded by DeAngelo Tyson of the Baltimore Ravens, raises over $73,000 in their first fundraiser. 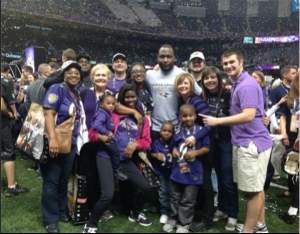 Having a desire to give back to the hometown that gave him hope and opportunity, Statesboro High School alumnus and current Baltimore Raven NFL Player DeAngelo Tyson founded The Tyson Foundation, a 501(c)3 non-profit organization in 2014. The goal of the foundation is to re-open a boys home in Statesboro after the closing of the last local boys home a few years ago. To kick off the fundraising efforts, The Tyson Foundation hosted its first dinner and silent auction on March 26, 2015 and a golf tournament on March 27, 2015. Both events took place at Forest Heights Country Club in Statesboro, Georgia. The board started with an initial goal of $20,000, however through the generosity of the community, both events netted approximately $73,300, if which 100% of that money raised will go towards the purchase of land and/or construction of a new boys home. The successful dinner saw DeAngelo himself as the keynote speaker while Jeff Raines of Low Country Auctions led the auction as auctioneer. David Cobb of Broken Shackles Ranch presented a video overview of their program, which has led a successful home for boys for over 40 years, to the capacity crowd of almost 300. The Tyson Foundation has partnered with Broken Shackles Ranch in their united effort to bring a boys home back to Statesboro. The golf tournament saw seven of DeAngelo's friends from his University of Georgia playing days and from his current NFL career join him, hosting their own fundraising efforts for the Foundation at various holes along the course. Those attending were Haloti Ngata of the Detroit Lions, Brandon Williams of the Baltimore Ravens, Abry Jones of the Jacksonville Jaguars, Cornelius Washington of the Chicago Bears, Fernando Velasco of the Carolina Panthers, former University of Georgia player Brandon Wood and former University of Georgia player Chris Burnette. “The amount of support we received from the community for a first time event was overwhelming. Our board put in a lot of hard work to make the dinner and golf tournament as perfect as possible. The goal of our board was to work hard and make sure everyone at the events had a great time with the common goal of opening a new boys home in Statesboro. We will continue high expectations of where we can go from here and what we can do to change the lives of young adults everywhere.” stated Foundation founder DeAngelo Tyson in response to the support and money raised.